Telluride Delivers realizes the importance of saving time. That is why we have engaged in a variety of time-saving services that we feel will enhance your Telluride experience by allowing you to truly enjoy the vacation you worked so hard for. The following is a description of additional services we provide. If you would like to inquire about a rate for a particular service, please call or e-mail us. Including (but not limited to) faxes, letters, documents, small packages and gifts. Do you need someone to run your errands? Pick up a few groceries? Return your rental equipment? We can have a courteous, professional delivery person on call for you, awaiting any task you have to offer. 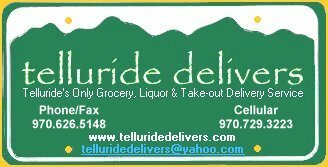 Why waste your time with meaningless tasks when you can call Telluride Delivers? Imagine a beautiful, decorated Christmas tree awaiting your arrival -- and you didn't even have to lift a finger! Click HERE for rates. Have a wonderful meal already cooked to perfection by Megan Langford, Private Chef delivered right to your home/condo on any date/time of your request. For more information on ordering pre-cooked meals, please click HERE. Would you like your rental car waiting for you at your unit? Would you like to avoid wasting time at the car-rental counter? We can have your car delivered to your unit prior to your arrival, and return it as well. Need a prescription delivered? No Problem. We recommend Sunshine Pharmacy for all of your pharmaceutical needs. What if you have the unfortunate experience of arriving to the airport without your luggage? Is your luggage going to arrive before you do? Just give us a call. We'll have your luggage delivered straight to your unit -- Fast. Would you like to have a nice bouquet of flowers awaiting the arrival of that someone special (i.e. - your boss)? Just give us a call - we'll take care of everything. Whether you need to get something done, but just don't have the time to do it, or you simply would like a little convenience during your vacation, Telluride Delivers is your connection to the wonderful amenities that Telluride has to offer.